ProKalm has recently been rated the UK's Number 1 in a survey of over 1500 participants* and is an innovation in helping horses and ponies perform to their potential using a unique formulation that acts rapidly in as little as 30 minutes with the effects lasting up to 8 hours. At low intake ProKalm is perfect for "taking the edge off". At moderate and high intake, ProKalm is suitable for more demanding situations. ProKalm is available as a feed supplement or as a syringe and can be fed as required, either for isolated situations or as a daily feed to achieve consistent performance. What? An innovation in helping horses and ponies perform to their potential and may aid concentration. Fast acting and effective supplement with results in as little as 30 minutes from feeding. A unique combination of herb extracts and amino acids and does not contain valerian, magnesium or tryptophan. 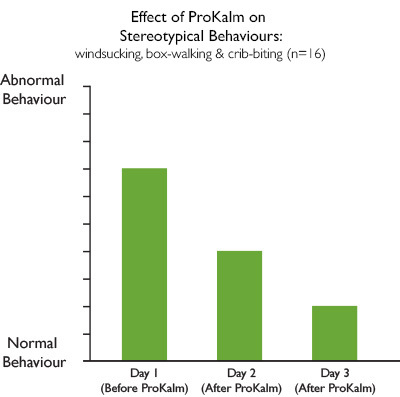 ProKalm does not sedate or affect gait or performance. Why? How ever well you manage horses, they are all individuals and at times may need that little extra nutritional support. This graph is for information purposes and relates to the information found in the study highlighted below. When? ProKalm is perfect for "taking the edge off" horses. At moderate and high intake ProKalm is suitable for more demanding situations. ProKalm can be fed as required, either for an isolated situation such as competing or can be fed daily. How? ProKalm is best given in feed on a regular basis. The effects of a single feed can begin within 30 minutes and last for up to 8 hours. The amount given can be varied to get the desired effect. Some horses require a higher rate than others. For a strong effect, e.g. to clip, shoe, box or when first turning out, give 2-4 scoops for a 500kg horses in feed or give one full syringe. For a mild-moderate effect , e.g. for riding, travelling, etc give 1-2 scoops for a 500kg horse in feed or give one full syringe around 1-2h before peak effect is required. For sustained results over time, give 1 to 2 scoops for a 500kg horse in both morning and evening feeds for at least 7 days. For first time use we strongly recommend feeding 2 x 25ml scoops per day split between morning and evening feed for a 500kg horse. If the effect is too strong then reduce the feeding rate. AND? Why not magnesium? There is no scientific evidence that magnesium has any calming effect in horses - Why not valerian? It is illegal under FEI and rules of racing - Why not tryptophan? Tryptophan signals to the body that it is exhausted and has a negative effect on performance. Available in 192g trial pouch, a 1.1kg tub, 3.3kg tub or ProKalm syringe. Introduction There are a very limited number of studies examining the effects of calming products on equines and the mechanisms underlying their use. Therefore many of the products on the market are not supported by scientific evidence (Harris, 2007); most companies rely on owner testimonials to evaluate their use, and they do not use controlled trials to demonstrate efficiency (Mckeever, 2005). The aims of the present study were 1) To determine if the reactivity of horses to a novel object test altered after seven days of feeding a commercial calmer (ProKalm, Science Supplements) 2) To determine if carers and instructors assessed the horse's behaviour and temperament as having altered after supplementation. Methods & Materials Sixteen mature horses without extreme behaviours were selected by the yard manager to participate. All horses were weighed on a calibrated weigh bridge to determine the quantity of supplement they received. Horses weighing over 600 kg received 5 scoops of the supplement daily and those weighing less than 600 kg received 4 scoops of the supplement daily (in accordance with the manufacturer's instructions). The horses were randomly assigned into two groups, one half that received supplement X and one half that received supplement Y for seven days. All horses completed a novel object test and had a temperament questionnaire completed by a student carer and two instructors on day 0. The horses were then fed their allocated supplement for seven days and on day seven underwent a novel object test and the questionnaire was repeated, to assess any changes in behaviour and temperament (both undesirable and desirable behaviours). During the seven days the horses' management regimens were kept consistent. Results Novel object test: Horses in the study group 'settled' significantly faster on day 7 than day 0 (P<0.05), and significantly faster than the horses in the placebo group (P<0.05). Horses in the placebo group increased their vocalisation and object investigation on day 7 compared to day 0 (P<0.05), whilst those in the study group demonstrated a significant increase in alert behaviours only (P<0.05). Conclusion In a group of horses with a range of behaviours typical of horses used for teaching, feeding ProKalm for 7 days resulted in both objective and subjective improvements in behaviour that could be considered desirable for handling, riding, training and competing. Introduction Stereotypical behaviours are common in horses. The purpose of this study was to determine whether a commercially available equine calmer (ProKalm, Science Supplements) could abolish or reduce the severity of stereotypical behaviours in horses. Methods & Materials Fifteen horses exhibiting stereotypical behavior on a chronic and continuous basis were recruited to take part in the study. Owners were given a questionnaire and asked to describe the type of stereotypical behaviour and rate the severity on a visual-analogue scale with 0 being no stereotypical behavior observed to 10 being most severe stereotypical behavior. The behaviours reported were wind-sucking (n=5), crib-biting (n=4), weaving (n=4), box-walking (n=2). Three horses exhibited 2 different stereotypical behaviours. Owners were asked to score the horses on Day 1 (prior to treatment) and then on Days 2 and 3. All horses received 64g of ProKalm split equally between morning and evening feeds. Results All horses ate all supplements. The median behavior severity score on Day 1 was 7 (range 3 to 10) and reduced to 4 (range 0 to 8) and 2 (range 0 to 8) on Days 2 and 3, respectively. Three horses (who all exhibited wind-sucking with a severity score of 7 or 8/10) showed no reduction in behavior severity score as reported by their owners. The greatest reduction in behavior score was with horses showing weaving and crib-biting. Behaviours reduced on both days of treatment. Conclusion Feeding 64g of ProKalm for 2 days split between morning and evening feeds to horses with stereotypical behaviours resulted in a significant reduction in median behavior severity score, as reported by owners. The effect was strongest with horses exhibiting weaving and crib-biting. Further studies using higher feed rates and for a longer duration are warranted. * In a survey conducted between March 2016 - May 2016 questions covered equestrian discipline, competitive level, reasons for using a product/supplement and their own experiences of the products/supplements they had used. 1689 complete, unique and valid responses were received. Only participants from the UK were encouraged and permitted. Responses were limited to one per IP address. ProKalm (Science Supplements) was rated the highest by both previous and current users.